September 11, 2018 at 2:17 am. 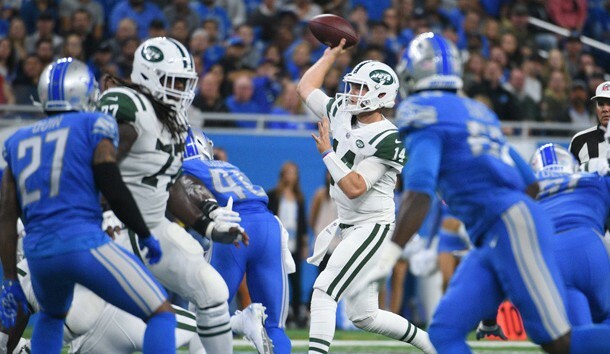 Even if you thought the Jets, a touchdown underdog, had a chance Monday night against the Lions in Detroit, only the completely delusional would’ve predicted a 31-point victory, especially with the inauspicious start in an eventual 48-17 victory. The win came with a lot of firsts. Like the first pass of Sam Darnold’s career, which was intercepted by Lions cornerback Quandre Diggs and returned 37 yards for a touchdown. The 21-year-old admitted to being nervous on his first play from scrimmage, but his teammates, including his sensei (and backup) Josh McCown, told him to shake it off, and Darnold remained confident in his ability. The firsts kept coming for Darnold — first completion (12 yards to tight end Neal Sterling to convert a third-and-6), his first touchdown (a 41-yard bomb to Robby Anderson to give the Jets a 17-7 lead, also on third down), and most importantly, his first win. But the firsts weren’t exclusive to Darnold, the youngest quarterback to start the opening game in the NFL since the AFL/NFL merger in 1970. The Jets scored 48 points, the first time they’ve reached that mark since the 2012 opener (a 48-28 win over the Bills), and the first time they’ve ever scored that many on the road. The last time the Jets scored more was 2008, when Brett Favre led them to a 56-35 win over the Cardinals. Coincidentally Favre and James Winston are the only other quarterbacks since 1991 to throw pick-sixes on their first NFL passes. The Jets also scored a rushing, passing, defensive and special teams touchdown for the first time since 1983. They got a punt-return touchdown — Andre Roberts’ 78-yarder to make it 38-17 — for the first time since 2012 (the same game they scored 48 points). Darron Lee (two) and Jamal Adams got their first-career interceptions, part of a five-pick effort off Lions quarterback Matthew Stafford and backup Matt Cassel that was the Jets’ most picks in a game since 1999. After taking a knee on the game’s final play, Darnold took the ball as a memento and got congratulations from his teammates. Let the hype machine begin. The Jets have a quick turnaround before their next game — Sunday’s home opener against the Dolphins, followed by a Thursday night game in Cleveland. The excitement level is already at a fever pitch. In the fourth quarter, as the Lions fans filed out following the Jets’ 31 unanswered points in the third quarter, Fireman Ed and his fellow fans began a J-E-T-S, Jets! Jets!, Jets! chant behind the team bench, much to the delight of Darnold and his euphoric teammates. Is this Darnold’s town now? Jets fans sure hope so, and Giants fans are dreading the thought since they could’ve taken the USC product with the second pick in the draft. Instead, he went No. 3 to the Jets, who couldn’t be happier to have him. Darnold finished 16-of-21 passing (76 percent) for 198 yards with two touchdowns and the interception. He did virtually nothing wrong after that, although the mistake was the first thing he was asked about after the game. Running back Isaiah Crowell scored his first Jets touchdown, bouncing outside for a 6-yard touchdown to tie the game (he later capped the scoring on a 62-yard run down the right sideline as part of a 102-yard night). Jason Myers hit his first field goal with the Jets to give them a 10-7 lead. Then came Darnold’s first career touchdown, as Anderson snatched a deep ball down the left sideline away from safety Tavon Wilson to give the Jets a 17-7 lead. The Lions, playing their first game under head coach Matt Patricia (a former Jets nemesis when he was the defensive coordinator of the Patriots), scored on Matt Prater’s 21-yard field goal to end the first half, and Golden Tate’s 24-yard touchdown on the first drive of the second half to tie the game at 17. But the Jets scored 21 points in 2:36 to take a commanding lead. First was Quincy Enunwa’s 21-yard catch-and-barrel-through-two-defenders into the end zone. Enunwa was playing his first game since New Year’s Day 2017 after missing all last season due to neck surgery. Next was Lee’s 36-yard interception return for a touchdown off Stafford, who was hit by Henry Anderson as he threw.It was New York’s first defensive touchdown in 74 games, dating to 2013. For all the talk of the Jets’ lack of a pass rush, they battered Stafford all night, briefly knocking him out of the game on a hit from Leonard Williams. He finished 27-of-46 passing (59 percent) for 286 yards, with one touchdown and his fifth career four interception game. Morris Claiborne also had a leaping pick of Stafford, while cornerback Trumaine Johnson made his first (there’s that word again) interception with the Jets. Adams’ interception came off backup Matt Cassel. Roberts’ 78-yard punt return gave the Jets a 38-17 lead, and Myers’ second field goal sent many of the 61,356 heading for the exits (at least those wearing blue). The ones wearing green and white stayed for the revelry. After he dressed, Darnold greeted his parents en route to the bus. “That was fun,” he said before giving his dad a hug. Winning by 31 on the road sure can be fun, Sam. NOTES, QUOTES: Stafford had zero passing yards in the first quarter for the first time in his career. … Lions K Matt Prater missed a 56-yard field goal attempt short. He was 43-for-56 (77 percent) from 50-plus yards in his career coming into the game. He later missed one wide right from 44 yards out, but the Lions were already down 41-17 at that point. … Lions DE Ziggy Ansah had a sack early in the game but left in the second quarter with a shoulder injury and did not return. … Roberts also had a 43-yard punt return to set up their first touchdown. His touchdown was his first since he had an 85-yarder and a 55-yarder for touchdowns in 2016 — for the Lions.